What more could you want than a warm drink while you are out training in the woods? Our Frontier Stove keeps the water boiling ready for anyone who wants a drink. Some of the procedures and techniques used in tree felling. A great day today training volunteers from the Hull MS Society in Emergency First Aid at Work. A Pheasant assists with Brushcutter training. Clearly this Pheasant is interested rather than frightened by training!! If you require training in Brushcutters or Trimmers please get in touch with us. 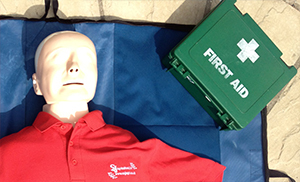 You may be aware that following a recent government review, changes are taking place to remove the direct approval of first aid training providers by the Health and Safety Executive (HSE). This significant change happened in October 2013, following HSE Board and ministerial approval. Video of a Land Rover Discovery 2 using anti-stall and off road driving techniques to climb rock steps. For more information on Off Road Driving and Winching Courses / Assessments please look at our training courses above.